Getting the right care, first time will ensure you receive the best possible treatment, leaving health services free for those who need them most. All children get colds. This is a normal part of growing up and no medicines can prevent them. The best way to look after your child is to make sure they have plenty to drink and if they have a temperature some paracetamol will help. Most doctors don’t recommend cough medicines and antibiotics won’t help a cold. Children’s paracetamol oral suspension and ibuprofen syrups – free from pharmacy if you receive free prescriptions. Mild laxatives to relieve constipation. Rehydration mixtures to use if feeling dehydrated after a bout of sickness or diarrhoea. Many pharmacies are open early until late and on weekends and bank holidays. You don’t need an appointment, and can just pop in and get expert medical help from a qualified healthcare professional. Most pharmacies now have a private consultation area where you can discuss your issues and concerns without being overheard. Many of Rotherham GPs and community pharmacies are part of the Pharmacy First scheme which enables you to get medication direct from the pharmacist without a prescription. Plus if you don’t normally pay prescription charges you can get medicine supplied under the scheme FREE OF CHARGE. Click here for a list of pharmacies. NHS 111 offers confidential health advice and information by telephone. Ring 111 if you are ill and have questions about your health and where to get treatment. Make an appointment with your local GP if you have an illness or injury that will not go away. Advice and information about a range of common winter health complaints, including how long symptoms will last and how to relieve symptoms is also available from the NHS website. Here you can find an easy to use symptom checker, can search for your local services and use the interactive First Aid toolkit. All appointments are booked in relation to clinical need. Our staff may ask for details of your symptoms to help identify the most appropriate person for you to see. We have a range of appointments available across our multidisciplinary team and our staff will signpost you to the most clinically relevant person. We will try always to accommodate the GP of your choice though the GP may be unavailable if they are already fully booked on the day you request, working at a different site, on leave or on a training course. Appointments can be booked over the phone or via the internet, if you wish to use the internet please let our receptionists know and they will give you the information you will need to be able to log on. If you would like us to remind you of future appointments please make sure we have your current mobile number on our system, you should then receive a message the day before reminding you of your appointment time. From Monday 7th August 17 St Ann's will be working with Rotherham CCG to run a Pilot called Care Navigation. We will now ask for a brief outline of your problem when you call to make an appointment at the practice. This isn’t because our reception staff are nosy but it’s a new approach that we call care navigation. For example, we often get calls that can be dealt with by a physiotherapist, the pharmacist, sometimes even the secretaries, that you may not be aware of if you haven’t visited the practice in a while. 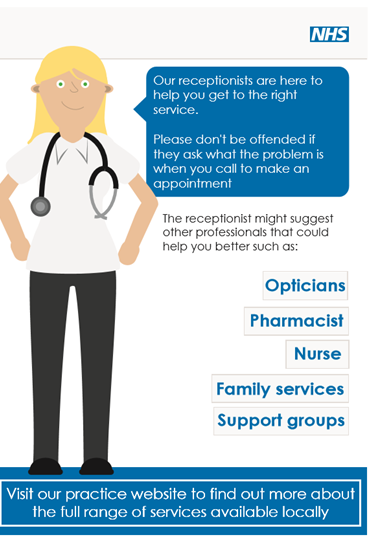 It would help the team to help you if you were to inform the receptionist why you need an appointment to see a GP. 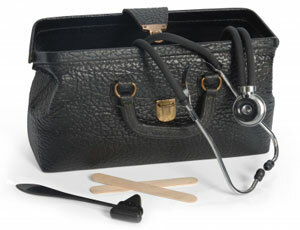 A doctor may phone you back as it may be that your problem can be dealt with by telephone advice. Visits will normally be made between 11:00 and 14:00, after morning surgery but before their afternoon surgery. House visits are only usually available for patients who are housebound because of illness or disability. Not every patient needs to be seen for their condition, sometimes a telephone call from the GP or Triage Nurse will be sufficient. If you think your problem can be resolved over the phone, discuss it first with our receptionists and they will guide you to the most suitable appointment. Weekdays 6:30pm until 8pm and weekend mornings there are routine GP appointments available at hubs based at Broom Lane, Kimberworth Park, Dinnington and Dalton. Please ask our receptionists for more details.